A very exciting opportunity to own a period cottage in this popular location. Sideways Cottage is surprisingly spacious offering no less than three reception rooms, three bedrooms plus dining kitchen and large bathroom whilst offering plentiful parking, detached garage and good sized garden at the rear. The property does need modernisation throughout but would make a wonderful home and really deserves to be viewed to appreciate the space and character of the property both inside and out. General Information - Shepshed is a popular location ideally placed for access to the University town of Loughborough with its fine range of amenities and also access to the M1 motorway at Junction 23. Shepshed itself has a thriving centre with a number of shops, pubs and restaurants as well as recreational pursuits. Epc Rating - An EPC has been carried out on the property with the resulting rating G. A copy of the full EPC (Energy Performance Certificate) can be viewed on www.epcregister.com searching via the postcode. Frontage - The property enjoys a generous plot with the frontage abutting directly to the roadway with a small raised paved area to the front elevation. To the side is a driveway mainly laid to granite setts with central paving which provides off road parking for three cars and leads to the detached garage. There is a good variety of climbing shrubs and plants with a notable mature wisteria to the main side elevation. Hallway - 2.56m x 3.08m (8'5" x 10'1") - With multi-paned windows with Bullseye panels to the main elevation, entrance door, tiled floor and matwell, ceiling beams, display recesses and light points, doors give access off to the rear reception room, the ground floor WC, store and dining kitchen. Rear Reception Room - 4.38m x 2.69m (14'4" x 8'10") - Having a dual aspect with multi-paned casement windows to side and rear elevations, feature fireplace with Oak mantle-beam, decorative ceiling beams and wall light points. Ground Floor Wc - With a two piece suite comprising WC and wash basin, storage off, ceiling light point and skylight. Store-Room - Accessed from the rear of the hall this store room would be an ideal pantry, cloak room, boot room etc and has ceiling beams, recess with storage units, shelving and terracotta tiled floor matching the hall. Sitting Room - 3.93m x 3.72m overall (12'11" x 12'2" overall) - To the main Ringfence elevation with a stone facaded fireplace surround, ceiling beams, wall light points and an open backed staircase rising to the first floor, electric storage heater and multi paned casement window. 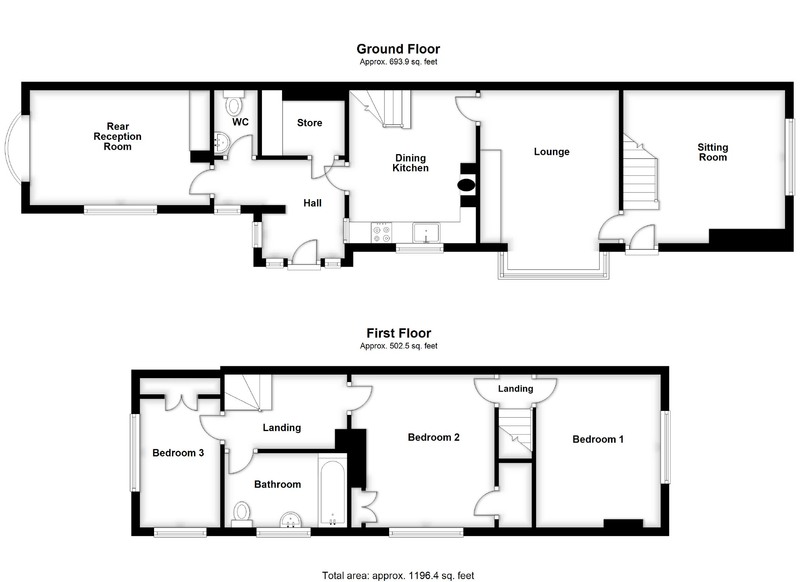 Small Landing - Situated between bedrooms one and two with wall light point and access off to the aforementioned rooms. Bedroom One - 3.68m x 3.04m (12'1" x 10'0") - Situated to the front elevation with chimney breast intrusion, ceiling beam and multi paned casement window to the front elevation. Bedroom Three - 3.69m x 1.92m (12'1" x 6'4") - Having a dual aspect with multi paned casement window to the property's side and UPVC double glazed window to rear, electric panel heater, built-in cupboard spanning the entire side wall and exposed beams. Bathroom - 3.10m x 1.88m (10'2" x 6'2") - Having a three piece suite comprising panelled bath, pedestal wash basin and WC with dado height and full height tiling to parts, ceiling light point, exposed feature beams and obscure glazed casement window. Rear Garden - To the rear of the property a gated access-way between the garage and the house itself leads to the rear garden where there is an initial paved patio space with climbing plants and shrubs leading via further decked and paved spaces with raised borders and a good sized area ripe for adding in lawn and further paving. There is a specimen willow and further large trees to the foot of the plot, additional patio spaces and space for a shed/greenhouse etc towards the foot of the plot.